Published: Aug. 20, 2014 at 12:48 p.m. Nothing can swing the momentum of a game like an explosive play. To that end, there's nothing like offensive players who make you hold your breath when they have the ball in their hands and defensive players who blow up a play before it has a chance to truly get going. As a part of our "14 for '14" series, here's a look at 14 explosive players for the 2014 season. Buzz: Cooper's production dropped in 2013 (58 receptions in '12 to 45 last season), but that was a case of Alabama spreading the wealth through the air. Cooper remains a dangerous weapon. He had four receptions of at least 50 yards last season, giving him seven in two seasons. He also has 16 catches that have covered at least 30 yards and 29 of at least 20 yards in his two seasons. He owns a career per-catch average of 16.8 yards and has scored 15 TDs. Buzz: You're probably saying, "Who?" and we don’t blame you. Cochran had just 37 receptions last season, but he covered a lot of ground with those catches. He was tied for second nationally with four receptions covering at least 60 yards; he had seven covering at least 40 yards, a big reason he averaged 18.6 yards per catch. 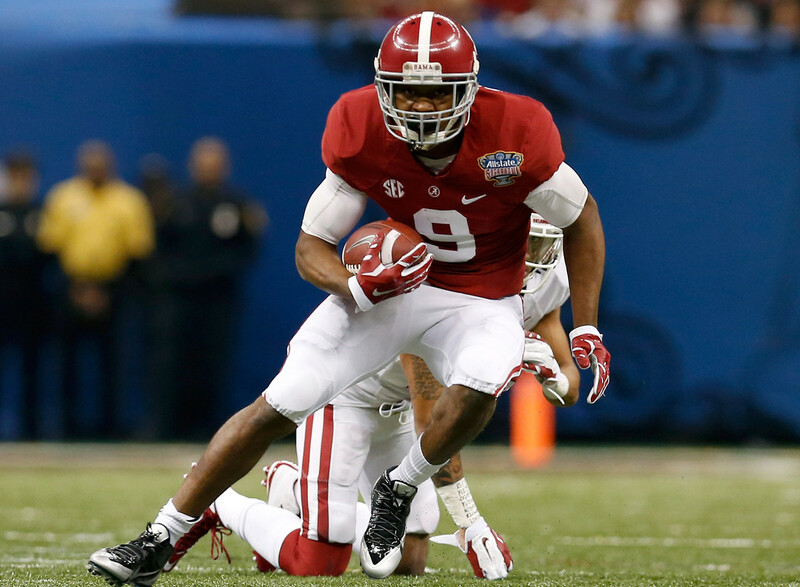 Cochran had four TD catches in 2013, and three of them covered at least 69 yards. Of his eight career TD receptions, four have covered at least 68 yards and five have gone at least 41 yards. Cochran owns a career yards-per-catch average of 18.1 yards. Buzz: Lockett is one of the best return men in the nation, with four TD returns and a per-return average of 31.1 yards in his career. He is a big-play receiver on a team not known for its passing attack. Lockett averaged 15.8 yards per reception on his 81 catches last season, and had 11 TDs. Six of his receptions covered at least 40 yards and four covered at least 50 yards. His 11 TD receptions averaged 37.4 yards, with three of them covering at least 56 yards. Buzz: Leslie spent his first three seasons at UTEP -- he graduated with an engineering degree and is transferring to BYU for his final season. It's a smart move, as BYU needs a go-to receiver. It's a smart move, also, in that he is going from a mediocre (at best) program to one that has hopes of winning eight or nine games this fall. Leslie, who has excellent size, was one of 19 players last season that had at least two receptions covering 70 yards and was tied for second nationally with four receptions covering at least 60 yards. In 2012, he had five receptions of at least 50 yards (tied for fourth) and 13 of at least 30 yards (also tied for fourth). He averaged 19.1 yards per catch in 2012, the best average of any player in the nation with at least 50 catches. Buzz: Diggs played in seven games last season before suffering a broken leg and missing the rest of the season. He averaged 17.3 yards per reception on 34 catches, after averaging 15.7 on 54 catches as a true freshman in 2012. Almost a fifth of his catches last season (seven) went for at least 30 yards and three covered at least 40 yards. Four of his receptions in 2012 went for at least 50 yards, and he also returned two kickoffs for TDs in '12. Last season, the average length of his three TD receptions was 40 yards. He should contend for All-Big Ten honors this fall. Buzz: Williams has been clocked as low as 4.76 seconds in the 40. That, folks, is moving for a man this big. He can play end or tackle, and has 13 sacks and 26 tackles for loss in his two seasons. Once he truly understands the nuances of his positions -- his athleticism is a big reason for his high tackles for loss numbers thus far -- he will wreak all kinds of havoc. While Pitt's Aaron Donald racked up big TFL numbers because of his quickness, underrated strength and innate understanding of leverage, Williams does it with quickness and sheer power. Buzz: He hasn't received much national attention, but he's jet-quick and flies around making plays for the Blue Devils. In the past two seasons, he had seven receptions of at least 60 yards, 11 of at least 50 and 13 of at least 40. Last season, he was tied for third nationally with five catches covering at least 50 yards, and in 2012, he was tied for the national lead with four receptions of at least 60 yards. But he's not a one-dimensional deep threat -- he has 184 receptions in the past two seasons. Four of his eight TD receptions last season covered at least 58 yards. In addition, he averaged 16 yards on 25 punt returns last season, with two TDs, and he was tied for the national lead with two returns that covered at least 70 yards. He also led the nation with eight punt returns of at least 20 yards. Buzz: Auburn ran the ball on 72 percent of its plays from scrimmage last season, and Coates had almost one-fourth of the Tigers' receptions (42 of 173, 24.1 percent). He often did some serious damage to opposing defenses on those catches: Coates averaged 21.5 yards per reception, the most of any player nationally with at least 40 receptions. He had three catches covering at least 60 yards, seven receptions of at least 40 yards and 14 of at least 30 yards (tied for third-most nationally). He had seven TD receptions, and they averaged 54.1 yards per pop. Buzz: Gregory led the Big Ten last season with 9.5 sacks and was fourth with 16 tackles for loss. He is a speedy force off the edge (he has been clocked as quick as 4.67 seconds in the 40) who could stand to get a bit stronger. But his pass-rush abilities definitely already have drawn the attention of NFL scouts. Gregory had nine sacks in 2011 as a true freshman at Arizona Western Community College, but missed the 2012 season with a broken leg and still is learning how to be a well-rounded defensive end. Gregory is from the Indianapolis area -- he signed with Purdue as a 210-pound defensive end out of high school but was an academic non-qualifier. Buzz: He was one of the best 100-meter sprinters and long-jumpers in the Illinois high school ranks, and he showed off his speed last season. He averaged 7.3 yards per carry and had five rushes of at least 50 yards (tied for second-most nationally), eight of at least 40 yards (tied for the most) and nine of at least 30 yards (tied for fourth-most). He scored 12 rushing TDs -- three of them covered at least 64 yards and six covered at least 40 yards. Buzz: Beasley led the ACC and was tied for third nationally with 13 sacks in 2013, giving him 21 in his career. He had 23 tackles for loss last season, raising his career total to 31. Beasley is extremely quick off the ball -- he was clocked at 4.47 seconds in the 40-yard dash in high school as a 215-pounder -- and frequently is able to use that burst to get around opposing linemen. He also has a nice spin move and a surprisingly effective bull rush. He is stronger than he looks and is adept at using his hands to keep opposing offensive linemen off his body. Particulars: 6-foot-1, 187 pounds, senior. Buzz: His full name is Dres Flipper Anderson and he's the son of former NFL WR Willie "Flipper" Anderson (his first name is pronounced "Drezz"). Dres Anderson tied for the national lead last season with seven catches of 50 yards or more and 10 receptions of at least 40 yards. He had 53 receptions overall -- about 20 percent of them covered at least 40 yards. His per-catch average was 18.91 yards, third-best among players with at least 50 receptions (Mike Evans and Odell Beckham Jr. were first and second). Three of his seven TD receptions covered at least 50 yards and another was a 49-yarder. Buzz: He rushed for 1,609 yards in 2013, 10th-most nationally and second in the Big Ten. He had 206 rushing attempts and averaged 7.8 yards per carry, the highest average for any back with 150-plus carries. Almost 25 percent of his attempts (50) went for at least 10 yards, and he led the nation with three rushes of at least 70 yards. He was tied for first with four rushes of at least 60 yards, tied for fourth with six rushes of at least 40 yards and also tied for fourth with nine rushes of at least 30 yards. In the past two seasons combined, he has seven carries that have covered at least 50 yards. Buzz: Goodley is explosive on and off the field. He has been clocked as fast as 4.39 seconds in the 40 and squats an amazing 660 pounds, second-most on the team. He also caught 71 passes for 1,339 yards (18.9 yards per reception) and 13 TDs last season, when he had five catches of at least 60 yards (most in the nation), eight of at least 40 yards (tied for sixth) and 14 of at least 30 yards (tied for third-most).